To print game reports through GotSoccer, just follow the steps below and it will create reports pre-populated with all the of match information necessary for the Referee as well as calling in scores at the end of the match. 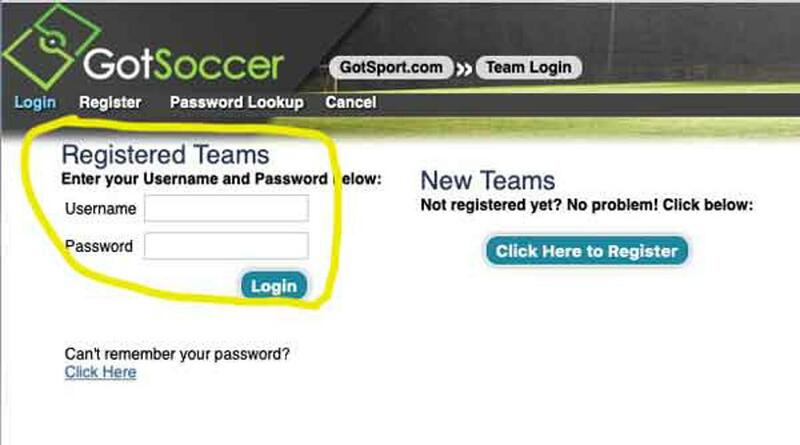 Log into your TEAM GotSoccer account, if you do not know your login credentials just contact the GLASA office. Once in the team account you should see a "ROSTERS" text link in the gray bar towards the top of the page. Click the "Rosters" link. On the right hand side of the page you should see a schedule of remaining games. 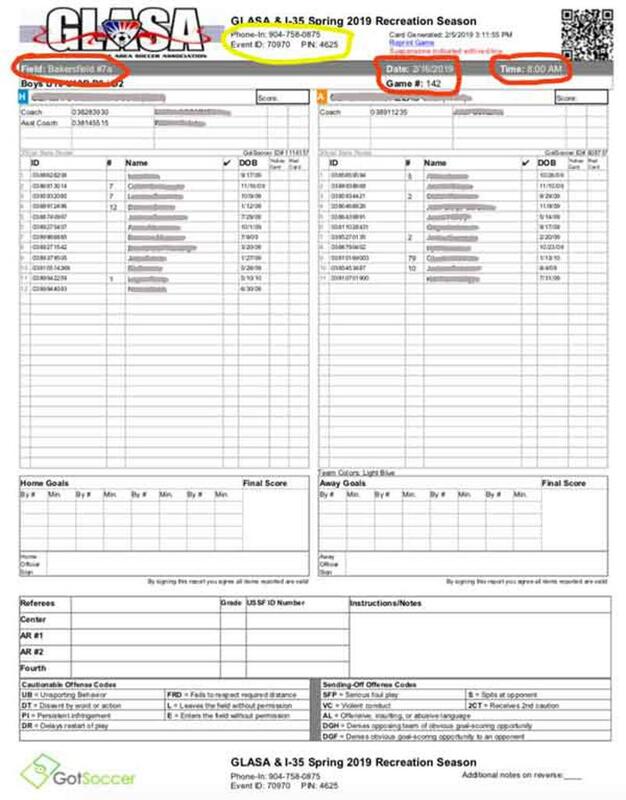 Click on the game number in the right gray box next to your upcoming game, this should cause a new window to open with your game report PDF ready for printing. On the Game Report you will see all of the score call in information listed at the top of the report (circled in yellow). Before the game each team should give the Referee a copy of the report for that game, after the match, the Referee will fill in the scores and sign the report. 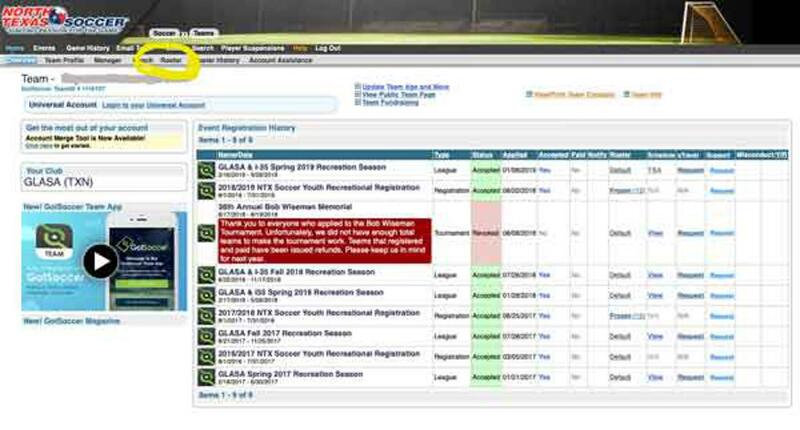 If NO CARDS are issued you will receive the game report back, if cards have been issued the Referee will keep the reports and submit them to A & D for card tracking. The Referee will write in the scores in the bottom corner area and tear off the bottom and corner for you to use to call in the scores. It is the responsibility of the HOME team coach to call in the scores, but if it does not get done within a day feel free to do it again. If all of your roster does not show a player number, you should add it on their player record. After all the numbers have been added you will need to contact your Registrar and have her update the team roster records.